I had a serious fish issue. What should I do with one more coho fillet? The galley freezer was full, we had already enjoyed BBQd salmon and iron skillet salmon this week, and the evening was too cool and wet to send the Capt outside to man the grill again. This called for something new, a flavorful recipe that would rev up our appetites for yet another salmon dinner. Here’s another two-thumbs-up recipe for a quick salmon entrée. Quick? How quick? This dish was out of the oven and on a platter long before our old charcoal BBQ grill would have reached the white ash stage, ready to begin cooking. Now that’s quick. All it took was a small bag of fresh vegies - a colorful mix of red, orange and yellow mini-sized sweet peppers - to point me in the right direction. OK, peppers and a quick glance at a few of my favorite seafood cookbooks for inspiration. A pile of peppers chopped into bright confetti, some capers, garlic, red onion and a basil vinaigrette all combined to create a new taste treat. The sweet pepper salsa provided a tangy contrast to the richness of the salmon. The flavors balanced nicely and oh my! it was so pretty on the plate. We’ll do this one again. A salmon fillet varies in thickness along its length, and this impacts cooking time. It helps to cut slices across the thick center of a fillet, and save the thinner tail end for another use. Be patient while the fish is in the oven, but check frequently for "doneness". Confession: I grew impatient after baking for 10 minutes when the fish registered barely warm in the middle. Broiling for an additional 5 minutes worked just fine for immediate consumption, but the several extra pieces were a bit dry after sitting on a platter for 10 minutes. Next time I will be more patient and will NOT use the broiler. It might help to remove the fish from the refrigerator 20 to 30 minutes beforehand to help even out the cooking time between thick centers and medium-thick pieces. 2. Mix the salsa ingredients together in a non-reactive bowl; set aside. 3. Sprinkle the salmon pieces with salt and pepper and place them in a baking dish that's large enough to hold them in a single layer without touching. 4. Spoon the salsa over the top of each piece. 5. Bake for 10 to 20 minutes or until barely cooked through; the fish will continue cooking after you remove it from the oven. 6. Remove the fillets to a serving platter or individual plates. Sprinkle fresh basil leaves and lemon zest on top and serve immediately. What is sea asparagus? 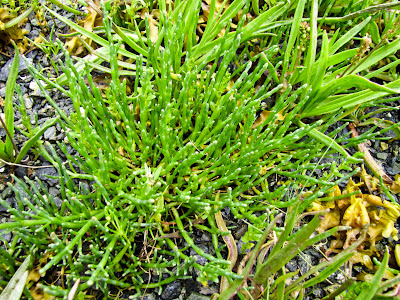 It’s not really an asparagus, not even in the same family of plants, but Salicornia virginica is commonly known as “sea asparagus”. 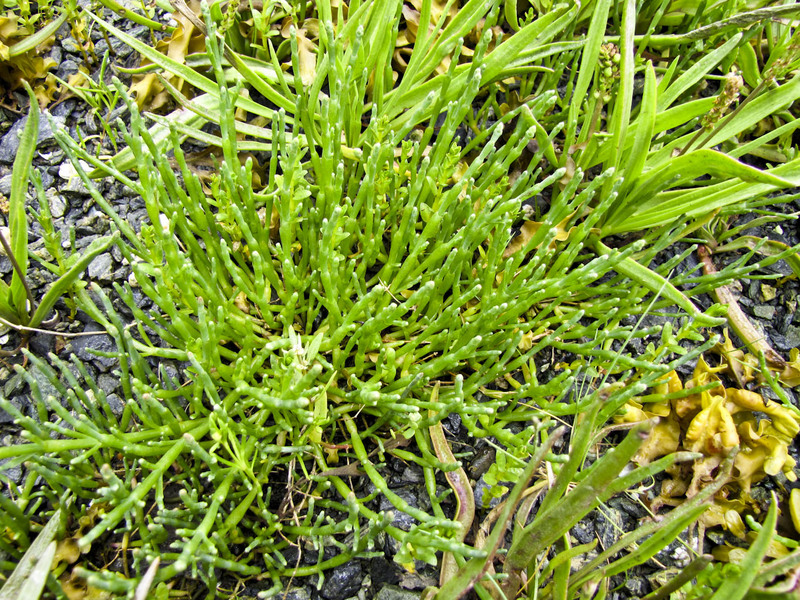 It is also called American glasswort, perennial saltwort and Pacific samphire. 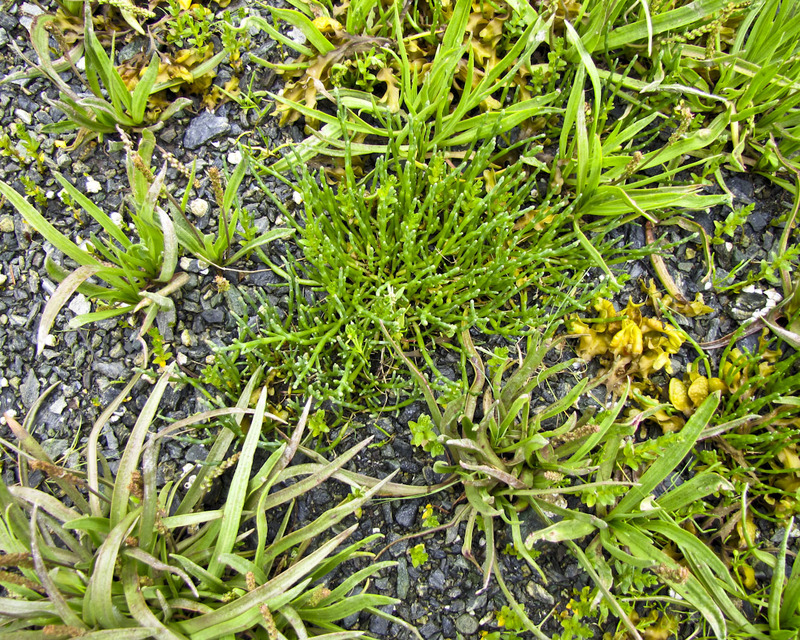 This intertidal perennial is found all along the Pacific Northwest coast in saltwater marshes, on tide flats and on beaches. It thrives on shores that don’t have strong wave action and surf. (ref. 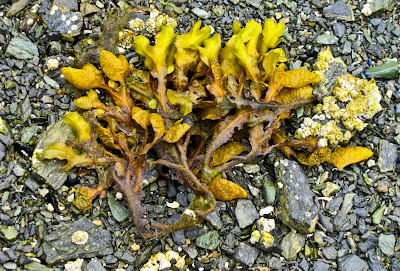 Plants of the Pacific Northwest Coast, Pojar and Mackinnon) Common in the upper intertidal zone of many shores, you will find it in the company of goose tongue and fucus. 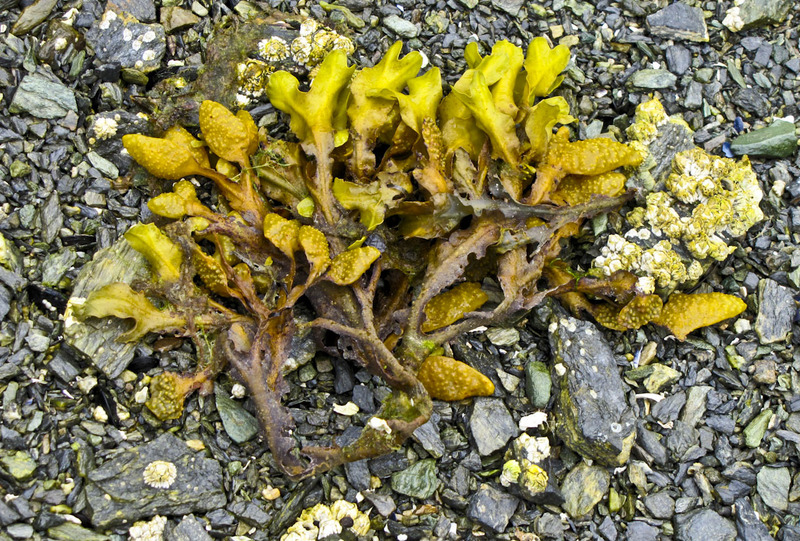 Fucus, a seaweed with bulbs that are fun to pop. 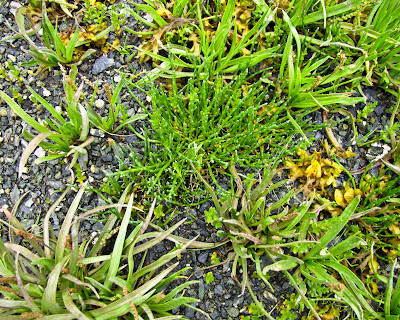 Sea asparagus is in the center of the shot, goose tongue has the broader leaf. I’ve gathered sea asparagus in the past, have even steamed it and tossed it with butter to serve as a sidedish oddity. It has the texture and crunch of a thin green bean, without the bean’s flavor to recommend it. It’s fairly tasteless, unless you consider salty a flavor. An unusual vegetable, it’s not something I usually seek out. I didn’t search for it this time, but kept crunching through it as I tromped along a rocky beach in Appleton Cove. I guess the sea asparagus found me. I enjoy the tangy shreds of ocean salad as a side dish with sushi or summer rolls and wondered if a dish of pickled sea asparagus might serve the same purpose. Just for fun I picked a sackful of the small, tender shoots for the following pickling experiment. Drain and toss with a bit of hot sesame oil. Top with sliced green onion and sesame seeds. The result was surprisingly good. Sea asparagus won’t make the team as a weekly vegetable offering, but its tangy crunch could earn it an occasional backup role as a condiment. Try it as a topping for steamed rice or cold soba noodles. Caution: it remains a very salty vegetable. Brrrrr. It was a dark and stormy night at the dock, and damned cold as well. Maybe not so dark, since it was summer in SE Alaska. But the evening was far too wet and windy to barbecue the shrimp on the aft deck, though the Capt. would have obliged. Instead I turned to a colorful, spicy indoor recipe to warm us up. Polar fleece, sturdy rain gear and an occasional visit to the hot springs pools may help to keep us comfortable outdoors, but there’s nothing like home cooking in the galley to warm up the ship and the crew. The aroma also seems to attract a few neighboring boaters who drop by to see what’s cooking. It’s hard to have just one favorite shrimp/prawn recipe when there are so many tasty choices. We love Cajun barbecued prawns, peel-and-eat shrimp fresh from the cooker, shrimp scampi, shrimp cocktail, shrimp quesadillas and more. 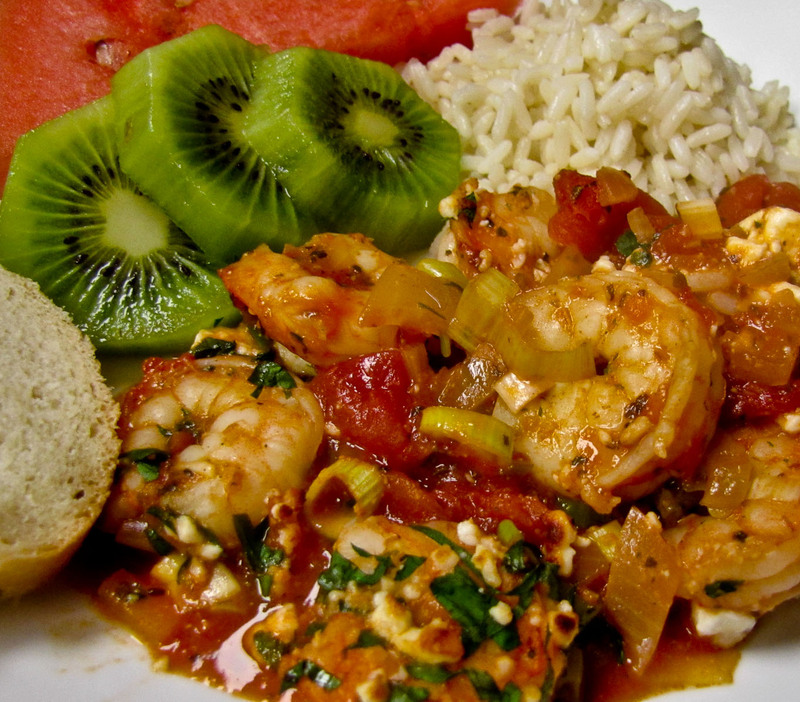 For that night at the dock, Greek Taverna Shrimp topped our list of favorites. The setting, with the muted thundering of a waterfall in the background added a special touch as well. Is this an authentic Greek recipe? I don’t know, but countless similar versions appear in so many cookbooks that I’m convinced it could be. I would love to travel to Greece to find out. 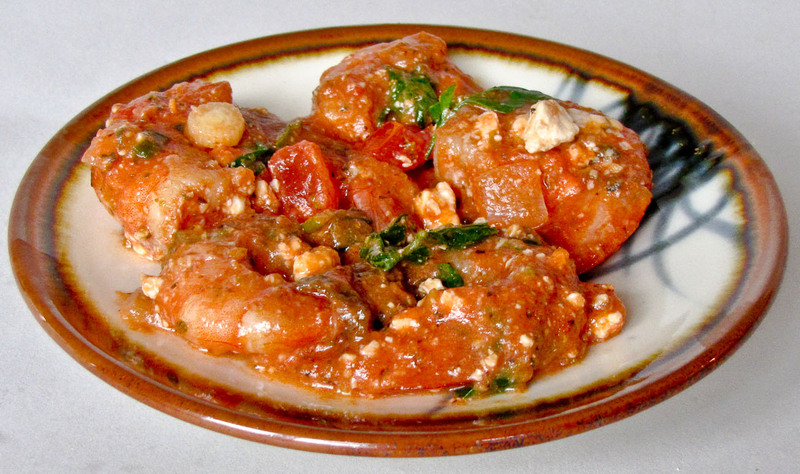 Noshing my way along the coast, nibbling on shrimp dishes, taverna by taverna sounds like a perfect research project. French bread, cooked orzo or rice to accompany. Sprinkle the shrimp with salt and pepper. In a large saute pan over medium-high heat, warm the oil. Add the shrimp and saute briefly (2-3 minutes), stirring and tossing the whole time, until the shrimp are barely pink. Use a slotted spoon to remove the shrimp from the pan and set aside in a wide, shallow ovenproof bowl, baking dish or 4 small ramekins. To the same saute pan add the onion and saute over medium heat until golden but not browned (4-5 minutes). Add the garlic and saute until fragrant (1-2 minutes). Add the pernod (or wine, etc.) and boil over high heat until reduced to about 3 tablespoons. Add the tomatoes and their juices, oregano, basil and pepper flakes. Bring to a simmer and reduce the heat to medium-low. Stir occasionally and cook until juices are thickened (about 20 minutes). Note: or use Italian seasoned tomato sauce and cook for 3 to 3 minutes till thickened. Preheat the oven to 400 F. or preheat the broiler. Pour the sauce over the shrimp. Sprinkle the feta and chopped green onions over the top. Bake until the shrimp are pink and firm, about 6-8 minutes, or broil until the cheese bubbles or turns golden, about 4-5 minutes. Sprinkle with the fresh chopped herbs and serve hot, accompanied by crusty bread, pasta or rice to soak up the juices. For a good measure of a restaurant and its kitchen, order a crab cake appetizer… if they offer it on the menu. (Note: this works best along the coast, not so much if you’re inland.) A great crab cake will highlight the fresh Dungeness crab, not the bread crumb filler or any crunchy, strong-flavored vegetables so often found inside. No diced, raw green pepper or fennel for me, please. Hellman’s or Best Food mayonnaise is the binder of choice, never Miracle Whip. 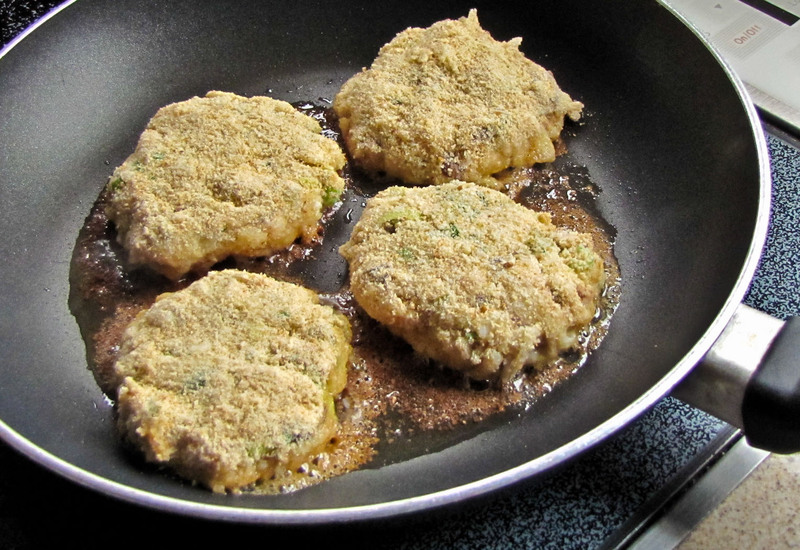 Lightly breaded crab cakes should be gently pan-fried and preferably in butter, never deep-fried or baked. Imagine my surprise when I scanned the menu recently at a nice SE Alaskan restaurant and couldn’t find crab anything listed. Hey! Crab live in the channel outside the restaurant. Crab boats dock in the local harbor. Commercial crab season was open. A local retailer sold crab, both live and cleaned. How can you not offer crab? Sigh, that night I settled for a nicely prepared ahi appetizer instead. Ahi… available in Alaska… but not crab. I remembered Sandy’s delicious Asian crab cakes in Helm Bay and vowed to play with my own recipe when we caught more fresh Dungeness crab. My latest crab cake inspiration began with the peppers, luscious vividly-green peppers that almost begged to be roasted and enjoyed. 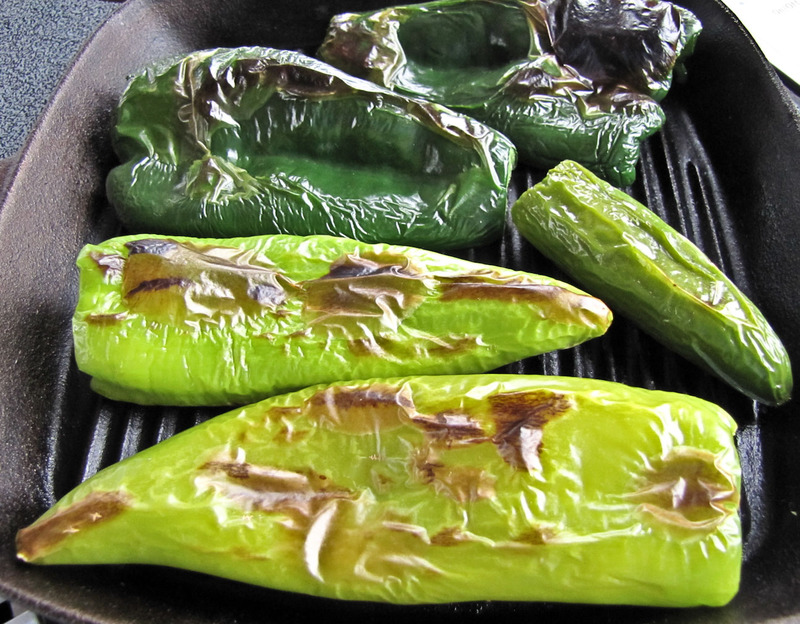 Two poblano, two Anaheim and one jalapeno. Now what? The poblano went into chowder, the Anaheims were stuffed and baked, and the jalapeno remained. How best to use that one lonely jalapeño? Jalapeno and crab cakes? salsa verde? pickled vegetables? spicy something! 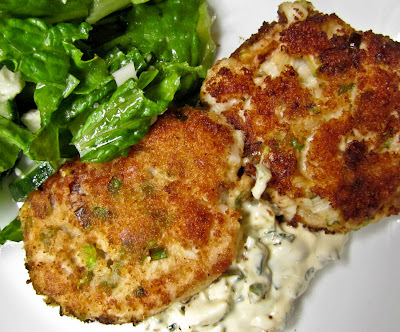 Then the combination of a jalapeno-spiked tartar sauce and crab cakes tempted my taste buds. Add the chile to a lime-flavored tartar sauce and then incorporate just a bit of that mixture into the crab cakes as well. Hmmm. This had possibilities, but it might be tricky to tame the jalapeno and still feature the crab. Step One: the tartar sauce. This experiment was well received, almost taste-tested away before it could be used with crab cakes. Too much jalapeno bite! Add a bit more sour cream. Need more zing? 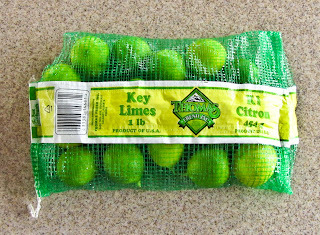 Add lime zest as well as juice. How would it taste on a tortilla chip? Mmmm, works fine as a dip, or straight off a spoon. Step Two: chile tartar-sauced crab cakes. The tangy bite of citrus and chile balanced the richly delicate flavor of the crab without overwhelming it. A crab taste still prevailed. Some Parmesan from a can (Yes, from the green can) along with the bread crumbs contributed a subtle difference that I liked. It is important to ightly squeeze the excess moisture out of the crab before adding it to the other ingredients. Use wet hands to form small balls, roll them in the breading and gently flatten them into patties. The crab mixture is loose and a bit challenging to handle initially. Don't fret, it firms up nicely in the refrigerator and the cakes transfer easily into the skillet. The cakes warm and soften as they brown, so turn them over once with extra care. If they brown too quickly, before the centers heat, place them in a warm oven to finish. Then turn down the heat under your skillet for the next batch. 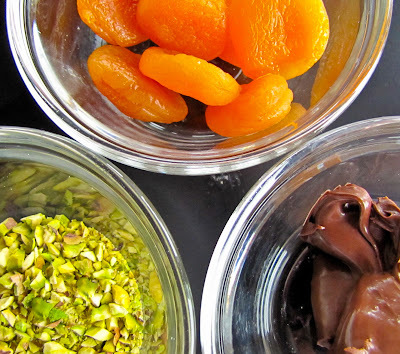 This variability within ingredients means this post is more of a guide than a precise recipe. So much depends on the heat of the chile, the moisture content of the crab, the size and thickness of the crab cakes etc. Fresh crab or a superior brand of canned crab, give crab cakes a try.They are easy to prepare and a treat for the cook and guests . One-bite, appetizer crab cakes are easiest to handle, less prone to falling apart in the skillet. 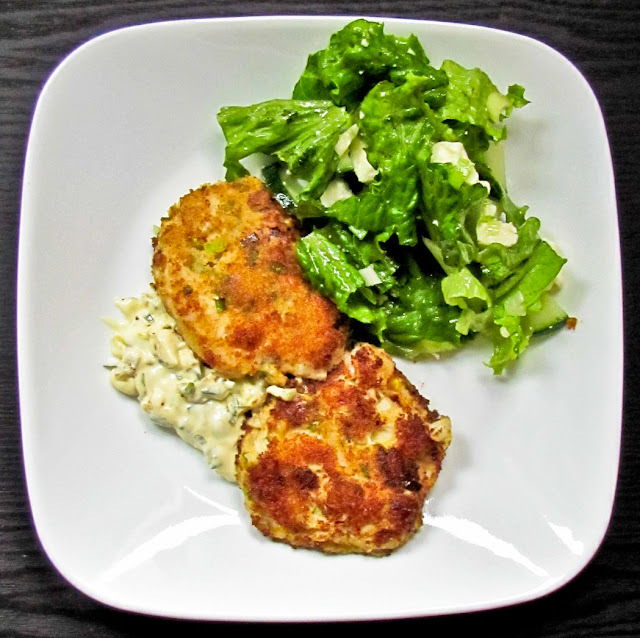 Pair two larger crab cakes with a green salad and you have a lovely lunch. Add some grilled French bread, a glass of wine and it’s a satisfying dinner. 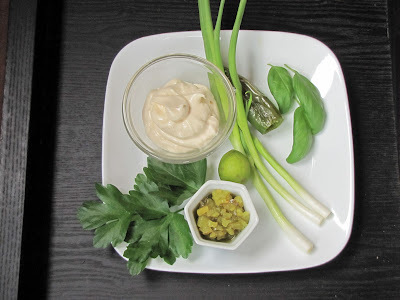 As for the tartar sauce, enjoy it on crab cakes, grilled fish or seafood tacos. It makes a peppy sandwich spread with cooked seafood or canned tuna. And did I mention how tasty it is as a dip? Have fun with this one. Squeeze the crab gently to remove any excess moisture. Place the tartar sauce, crab, cilantro, scallion and 1/4 cup breadcrumbs (or breadcrumb and Parmesan mix) in a bowl. Mix lightly, only until the ingredients are just combined. Moisten your hands and form into 4 small balls. Dip each ball into a flat pan or pie tin full of the remaining bread crumbs, coat on all sides as you gently flatten each balls into a patty. 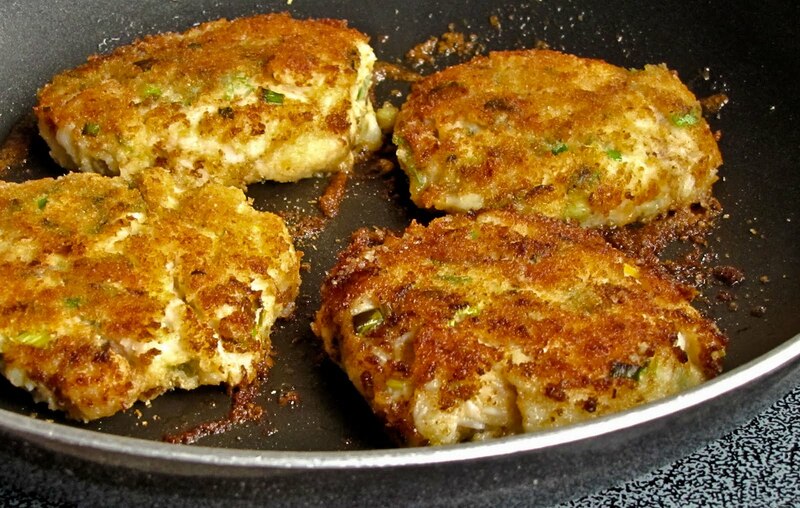 Leave the patties in the pan, cover with plastic wrap and chill for an hour or more , if time allows, to firm up the crab cakes. Heat the oil in a large cast iron or nonstick skillet over medium heat until hot but not smoking. Add the butter and swirl until it melts. Gently arrange the fragile patties in the pan so they aren’t touching. Cook until golden brown on one side; use a spatula and your fingers to turn once carefully and brown the second side. Cook until hot through, about 155 F on an insta-read thermometer. To serve, spoon some of the remaining tartar sauce onto each plate. Use a slotted spatula to transfer hot crab cakes onto the sauce and serve immediately. Mix all ingredients thoroughly; season to taste. Chill for an hour before serving. The sauce will keep, referigerated, for a day or two. Note: these are mild peppers, but chiles vary in heat so add a bit at a time. 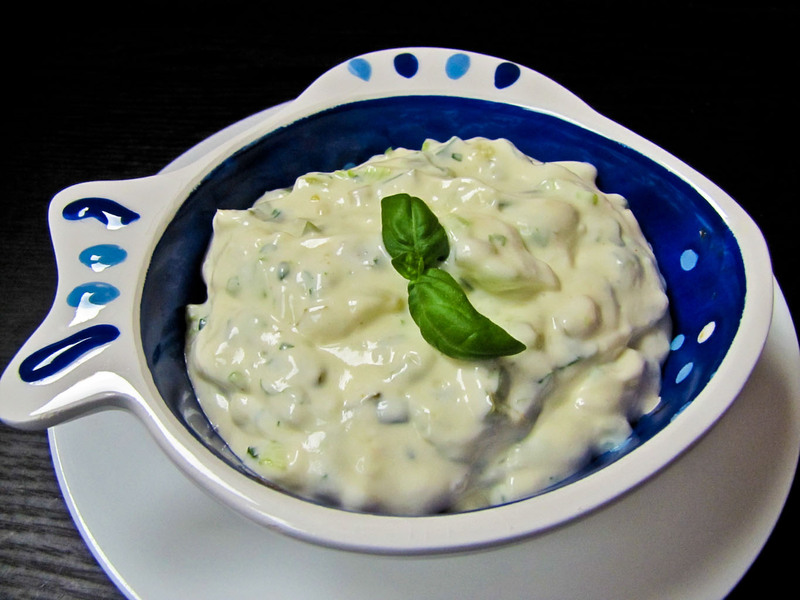 The heat will increase a bit over time; you can add more mayo or sour cream to tame the bite if preparing days ahead of time. Managing fresh produce onboard presents an interesting challenge for a cruising cook, even in our cooler climate. Rhapsody has one standard-sized household refrigerator with no extra coolers, etc. for cold storage. That calls for restraint when I provision. It is so tempting to select fruit and vegetables at their peak of ripeness, colorful and vitamin-rich, bursting with flavor. That works well for a day or two, but it isn’t a good idea when grocery runs are ten days to two weeks apart. So I’m the shopper you see picking out a few ripe items to enjoy immediately, and pounds of green bananas, green mangos, rock-hard avocados, etc. for the future. 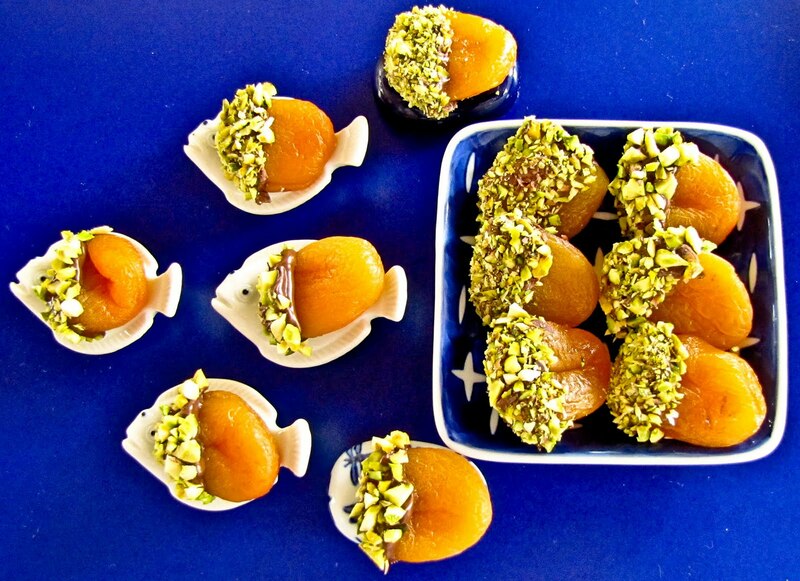 Can you imagine passing up fragrant, ripe peaches for the green, hardball variety instead? Sigh! Storage is a key issue. Our galley and salon are usually warm spaces, heated for crew comfort by solar gain through large windows or by an Espar heater. That’s good for people, but the produce isn’t happy. 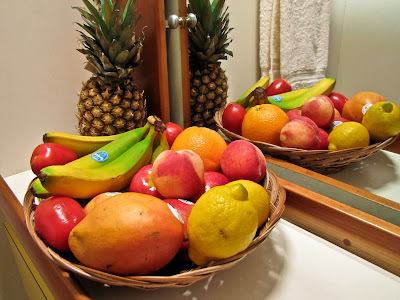 When we don’t have guests aboard the guest head is the coolest room on the boat; its counter and shelves often hold several baskets of fruits and vegies. It’s might look a bit odd if you don’t expect the colorful items, but it works. 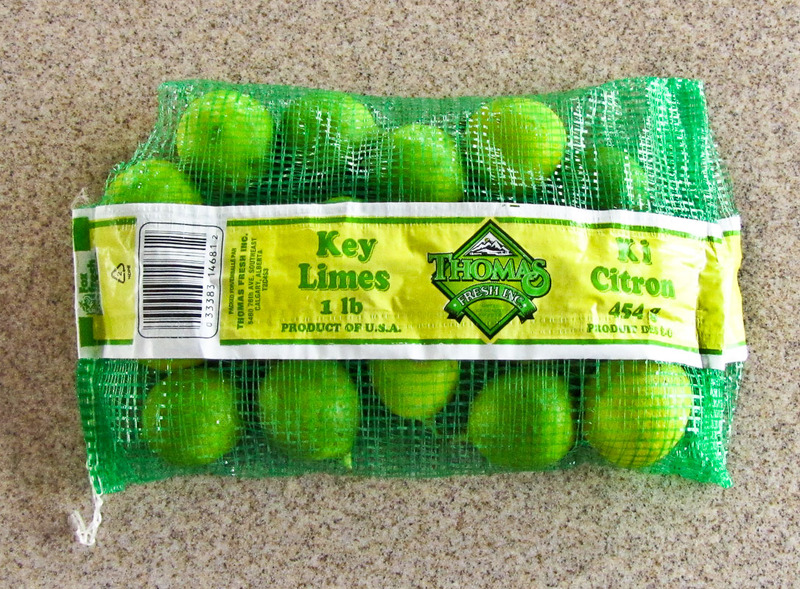 The bought-when-green fruit can be flavor challenged when it does ripen. That’s when I rely on my small herb garden to add some zip to otherwise bland fruit salads. 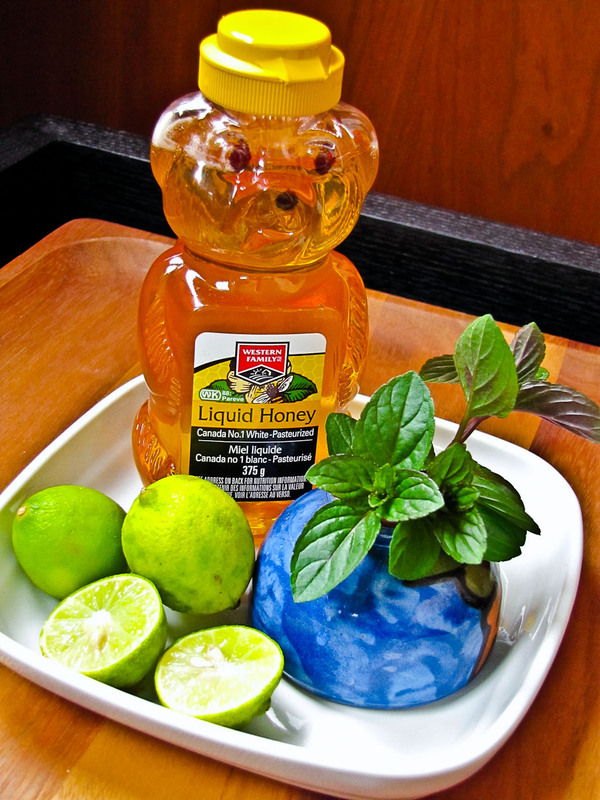 It’s amazing what a little mint can do, along with a mixture of honey and lime. This mint mix is such a favorite that we also drizzle it over already tasty fruit, or Greek yogurt, or add some olive oil to make a vinagrette for spinach salads, or top a cream cheese covered cracker for an appetizer. 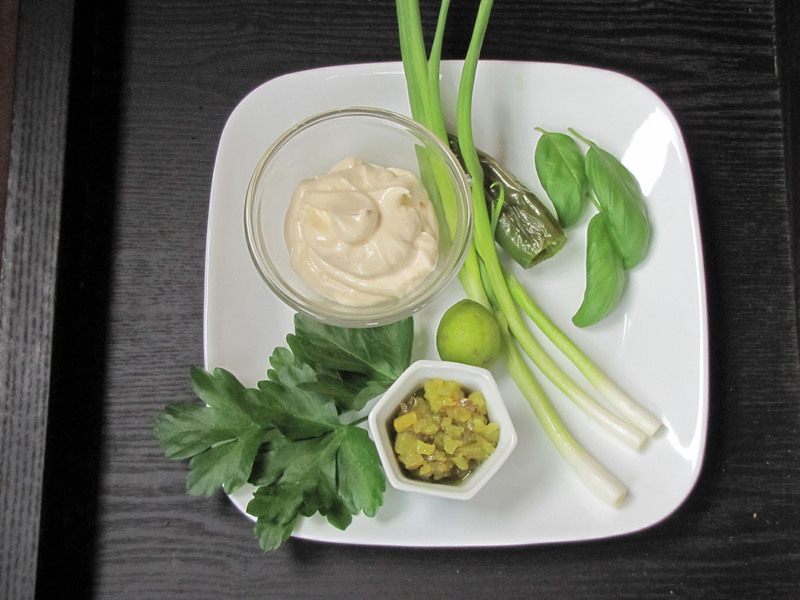 What an amazing flavor punch from a three-ingredient sauce! 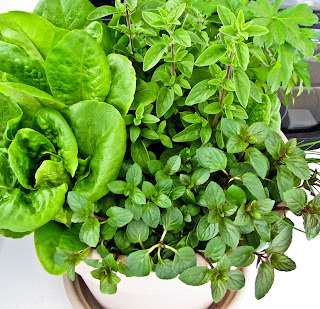 * You can substitute 1 tablespoon dried mint for the fresh, though the flavor won’t be as intense. Increase the ingredients to feed a crowd. Arrange the fruit on a small platter and drizzle the sauce on top or serve it alongside in a pitcher or gravy boat. Entertaining aboard is very relaxed. There are no large formal dinners afloat on Rhapsody, oh no. Casual events, impromptu or even participation dinners are more my style. While I love to cook, entertaining is more about socializing with interesting people than about the food. Barbecued salmon is the Capt’s specialty, and I love creating the side dishes to fill out the menu. Salmon would not have been a special treat for our latest dinner guest. A native Alaskan she lives on an island, uses a skiff instead of a car, is married to a fisherman, and has a freezer full of seafood. Forget seafood anything, we dined on chicken and sausage gumbo instead. Gumbo, rice and a green salad were the main event, but I couldn’t decide on a dessert. I don’t crave sweets, so I don’t think much about desserts until we have company. Phooey! The day was too warm and sunny to stay inside and bake something. Instead I grabbed the camera and wandered along the shoreline and up in the woods all afternoon. Dessert would have to be an easy recipe, something quick to pull together at the last minute using simple ingredients. A cabinet packed with dried fruit, a variety of nuts and a jar of Nutella provided inspiration. That was all I needed for Nutty Chocolate Fruit Bites, a simple dessert I hadn’t thought about in ages. It must have been a good choice; we ate two-dozen pieces that evening. Well, almost two dozen. There were still two apricots remaining when the Capt and I tidied up the galley. We ate them. My quick dessert used dried apricots, Nutella and unsalted pistachios. Now I am tempted to try a batch with fresh banana chunks. I remember the delight of frozen bananas on a stick, a favorite teenage treat on summer trips to Balboa Island. Hmmm, Nutella and nut-dipped chunks of frozen banana on a skewer might replicate that taste - a little bit of memory on a stick. I’ll get back to you on that. Cover a flat plate or small tray with a sheet of waxed paper. 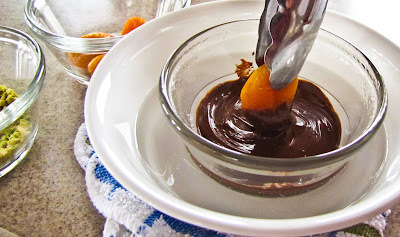 Spoon the Nutella into a small microwave-safe bowl; place this bowl in a slightly larger bowl filled with an inch or two of water. Microwave the stacked bowls for a minute or more, just until the Nutella softens a bit. 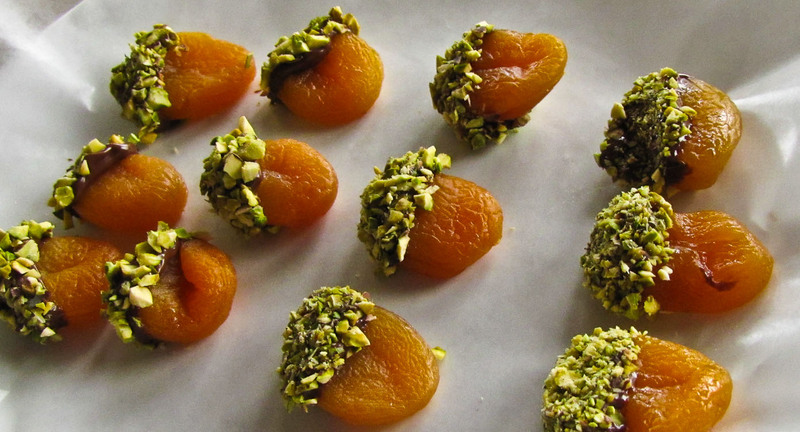 Lay the coated apricot on the waxed paper. Repeat with the remaining pieces of fruit. Refrigerate until the Nutella hardens, about 30 minutes. 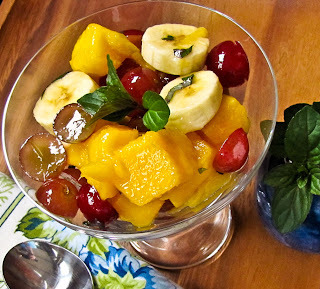 This recipe adapts well to other fruits, both dried and fresh. 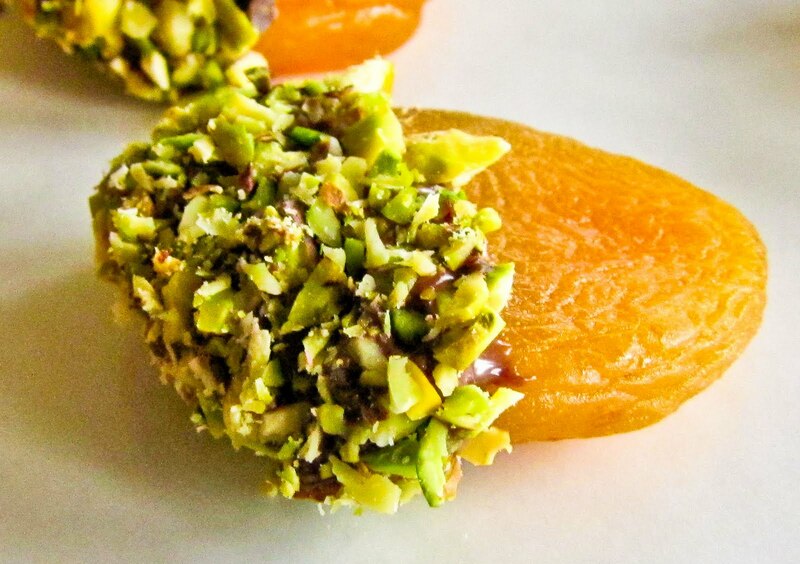 The dried fruit should be large enough to have both dipped and undipped halves; dried pears are a good choice, dried cranberries not so good. 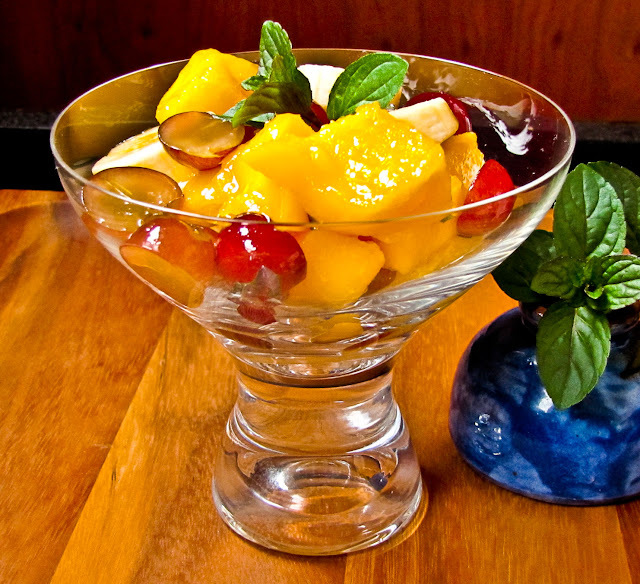 Fresh strawberries are fine, but apple slices or banana chunks tend to turn brown and need to be dipped in citrus water. Peaches might be too moist and soft. 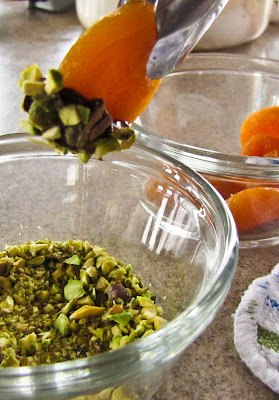 Vary the nuts as well, according to taste and whatever is in your pantry. Peanuts, almonds, pine nuts, whatever. Nutella is a versatile product. Use it to fill elegant dessert crepes or spread it on your morning bagel. It’s pretty good nibbled straight off a spoon too. This is a good item to keep in the pantry for emergencies.